We go on the bus, play and read stories at playgroup. The group has given me the chance to make new friends, and to practice my English. My children love coming to group. Yes I tell all of my friends to come! The kids are wonderful and our music group gets everyone mixing together. The mums love to dance and encourage us to join in too. 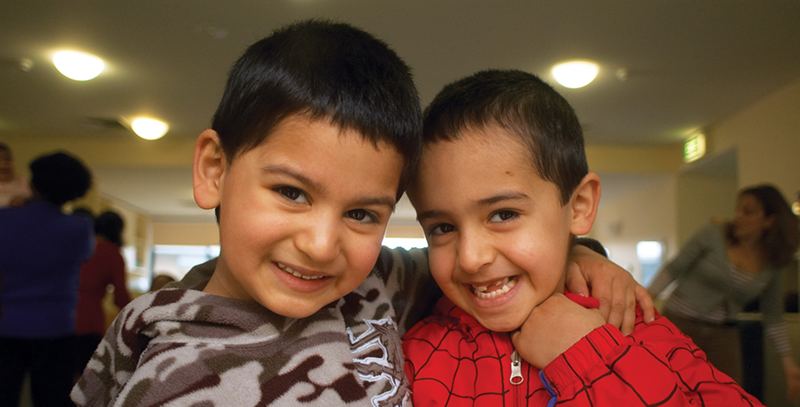 This playgroup is focussed on supporting mothers who are new arrivals from Afghanistan. We help them make new friends and become involved within the community. QEC’s staff coordinate the involvement of services such as Maternal Child Health, the library, Centrelink, community support workers and other relevant agencies to support the mothers. The playgroup has visiting speakers to ensure families are aware of services, child development and safe practices within their community. The program aims to provide culturally specific parenting education and child health care, as well as support through playgroup activities. It also helps to identify families who would benefit from an intensive Parenting Plus program. Furthermore, QEC also facilitates the provision of more formalised education opportunities through community organisations such as Maternal Child Health, Centrelink, the library, Immunisation and Migrant Resource Centre. The groups are co-facilitated by community leaders and QEC Parenting Plus staff. This playgroup has proved to be rewarding for everyone involved. There have been many opportunities to learn from the mothers about their culture through discussions, outings and cooking. The group runs every Thursday from 9.30am- 11.30am. If you can't get to the group we will pick you up in the bus between 8.45am- 9.30am. We have car seats for every child in the bus. We begin the group with informal discussion and education followed by morning tea which the Mothers take turns cooking. • something for morning tea - perhaps a piece of fruit or some sweets. Often the mothers in the groups like to bring a cooked meal and they all have group meal which is celebrated together. How can we get to the play group if we cannot walk or have any other transport? Do we need to have our own car seat to travel on the QEC bus? No, QEC has car seats for all children when they are travelling on the bus. How much does it cost to come to the group? There is no cost to attend the play groups at QEC. How old can our children be to attend? Children are usually aged younger than 4 years of age. What will we do at the playgroup? There is an opportunity to meet other mothers that are new to Australia and children are able to play and learn together. Expert advise from QEC staff and community service like Centrelink and the Child Health Nurse are able to assist you in learning about what is available to you in Melbourne ,Victoria.